You can choose your own word or phrase to say as a wake-up command. 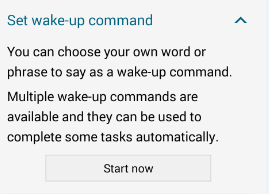 Multiple wake-up commands are available and they can be used to complete some tasks automatically. Galaxy TabPro S: How Can I lock screen with password, PIN or Picture Password?